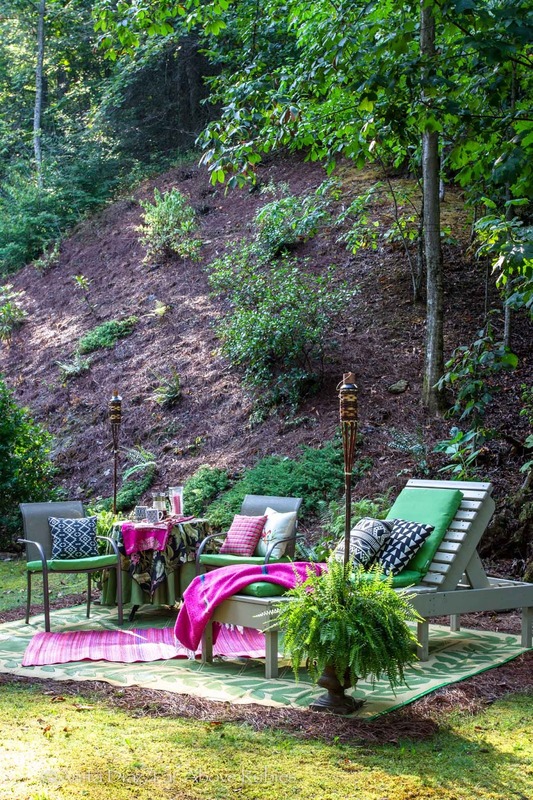 The katydids are singing at night signaling that autumn is on the way, but with the heat we are experiencing in the North Carolina mountains, fall seems very, VERY, far away. In the meantime, we are enjoying every bit of outside time we can in between rain showers. Since we moved here eight years ago, this spot has sported a gigantic swing set. I thought it was time for it to go as it had no swings left on it, and the kids are now 10, 14 and 16. Luis and I would really like to install a curvy paver patio here, but that is not in the budget, so I decided to style it anyway so we could use it. And isn't that what it's really about? Making do with what you have? 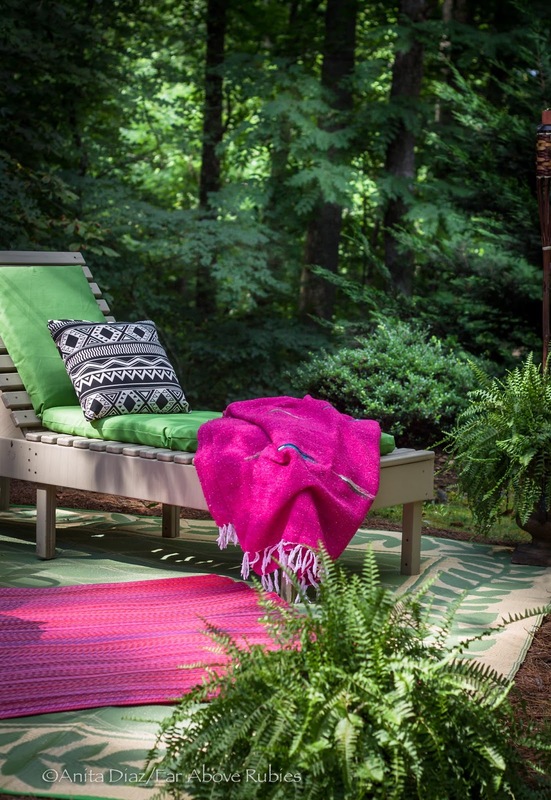 Since there was a mulch bed here for the swing set, I bought an outdoor camper rug to put over the mulch. Camper rugs are about half the price of a regular outdoor rug, so I thought it couldn't be a bad investment at $49 for a 9' x 12'. For some color, I added the pink recycled bottle rug that replaced the one that faded. I found these stackable chairs at Lowes for $20 and thought they would be great here, and we can put them around the fire pit when needed. 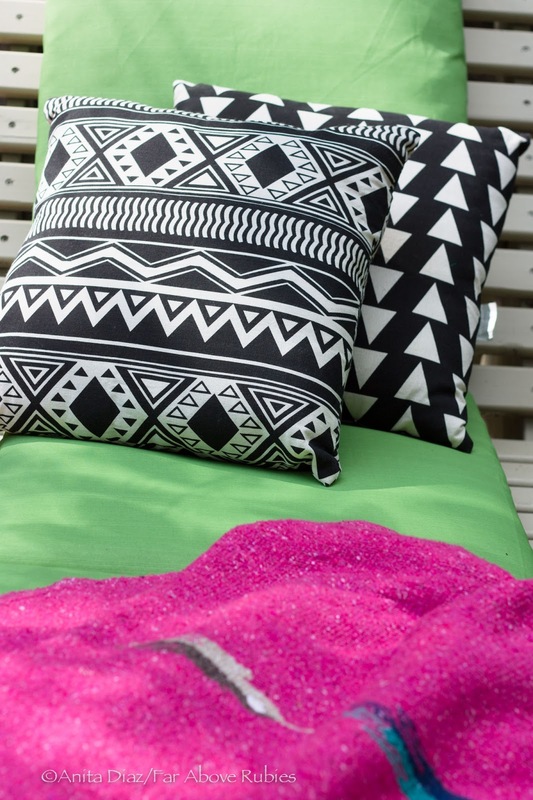 I also brought out more of the black and white print pillows and the seersucker plaid pillow I made for color and softness. This is such a nice spot and my 16 year old has already claimed the chaise for summer reading. The chaise had been thrown away where Luis works, so he asked to bring it home, and we repaired it, cleaned it up and now have this great piece for lounging. 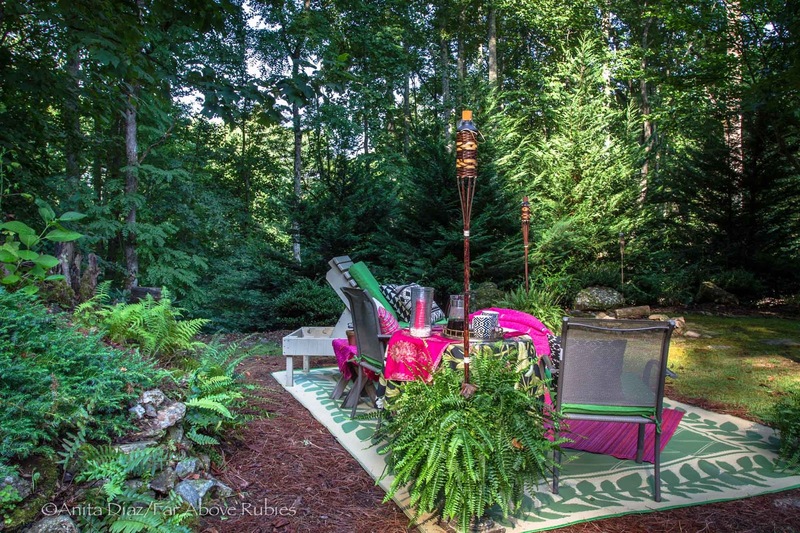 I added a few ferns and "planted" my tiki torches in the pots. Instead of the swing set, we now have a place we can all enjoy hanging out as a family. And *nothing* makes me happier than that as I try to spend as much time as possible with these babies before they leave this nest. I LOVE it!!! This area is so beautiful! I love being surrounded by God's beauty in nature and this is heavenly. Thanks for sharing. Have a wonderful day! 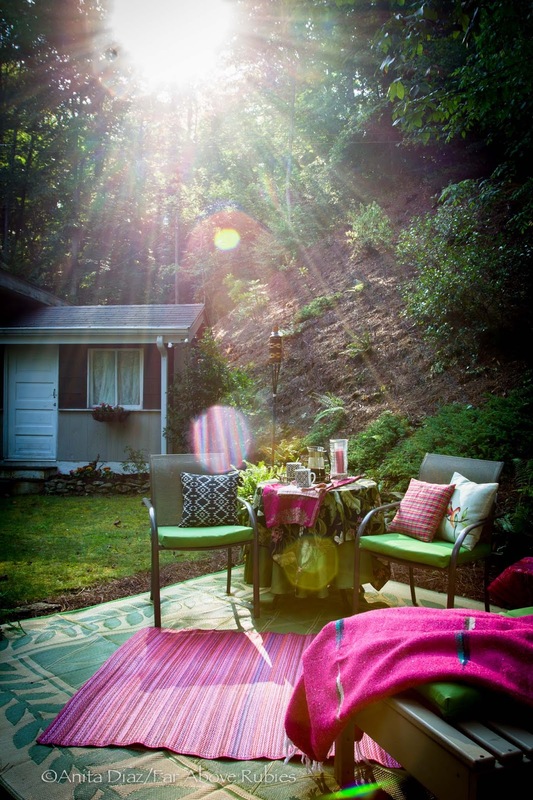 A beautiful spot in your back yard. I love your mid century modern coffee carafe, too. 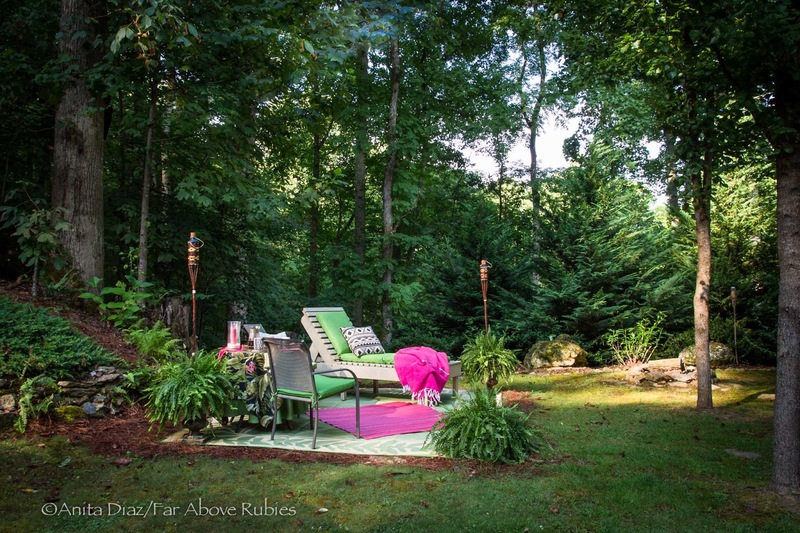 A beautiful retreat in your backyard! The vibrant pink makes it so special. Good deals to be had and enjoy your time with your children:). What a lovely and peaceful oasis. I can see myself doing my Bible studies under the trees, listening to the birds sing. 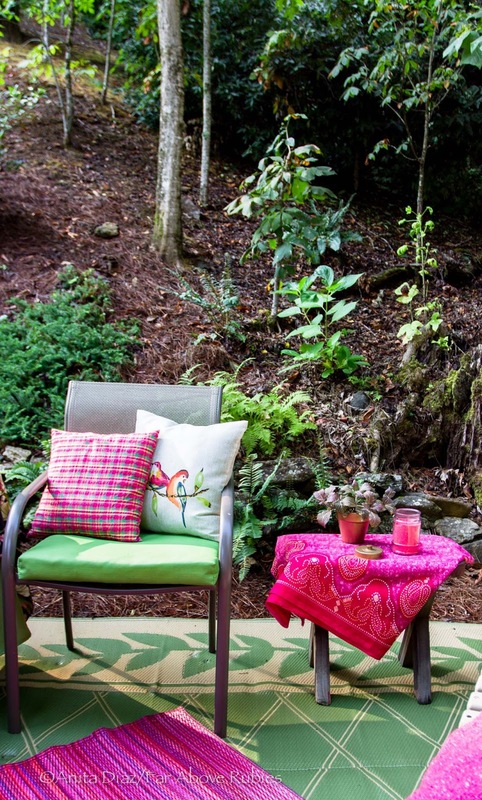 Yes, what a most beautiful oasis...and you carry out the gorgeous colors from your home to brighten up the outdoors too! 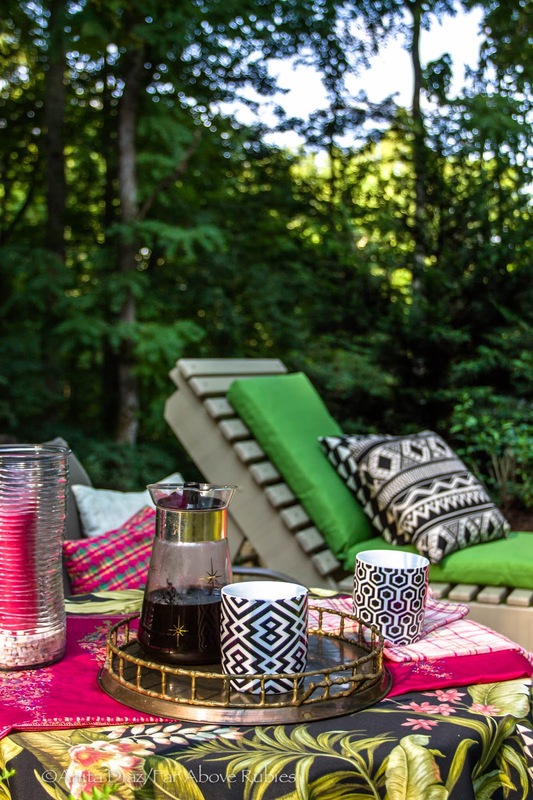 Great deal on those pillows!....You have created a truly beautiful outdoor space for you and your family. So pretty. I could hang out there for days. Anita- this is so pretty. I love the touches of dark pink. This is absolutely beautiful! 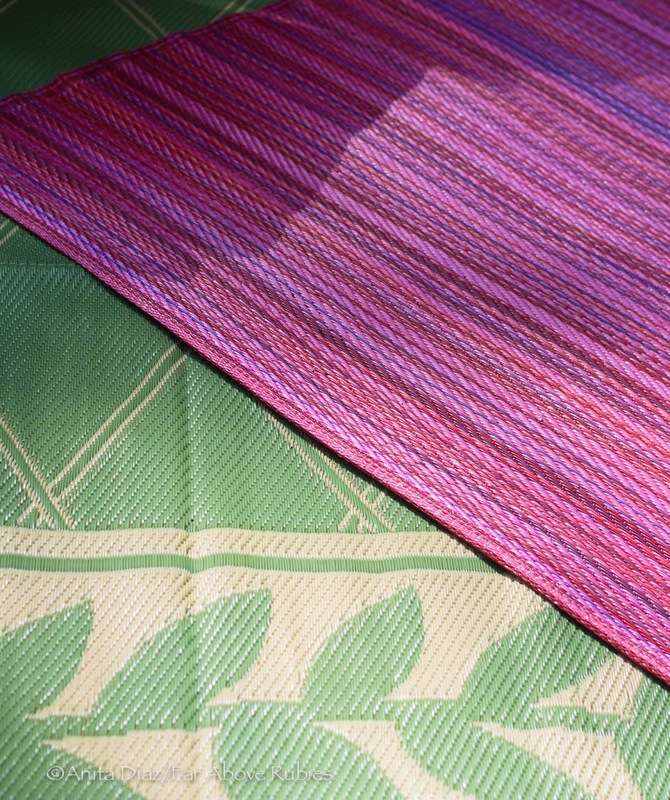 The pink is such a pretty contrast to the green all around it. 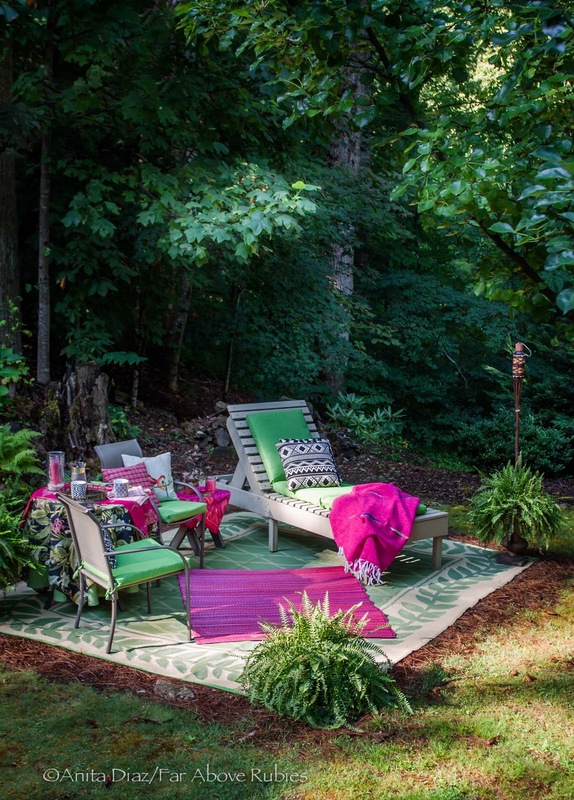 This is such a lovely space, filled with color against the green background. Just wonderful. 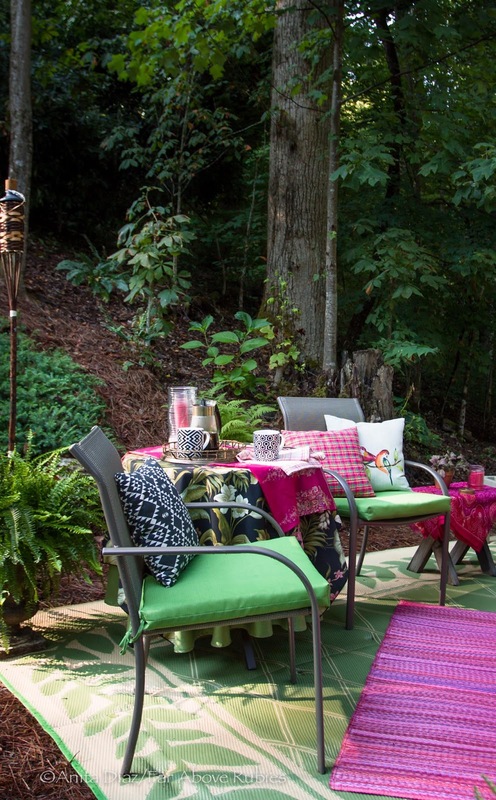 Love all the vibrant colors- and love the idea of setting up your own beautiful space outdoors! Didn't know about camper rugs; I was wondering if you had to pick up the carpet each night. Such a great idea.. just love it all! !